Students in grades 4 and 5 in Lower Dauphin SD are giving back to their community through the Helping Hands program, a volunteer service. At South Hanover Elementary School, Mrs. Kalloz, the school counselor, coordinates the activities throughout the year for this program. Students are involved in school activities as well as community service events. Some of the group’s service projects include volunteering at senior centers, clean-up projects, reading to preschool children and filling bags for the Red Cross Disaster Relief Program. 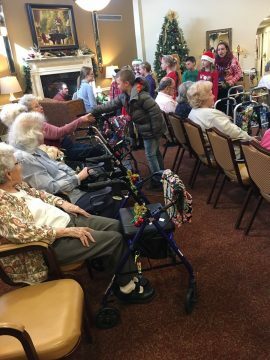 In December more than 80 members of the group sang carols and distributed handmade ornaments, which they made during recess, to residents at Country Meadows senior living community.